Lightroom Classic Tutorials > Organizing Photos > Folders on the Hard Drive > How do I rearrange existing photos into a new dated folder structure? Select All Photographs in the Catalog panel. In the Date column, highlight a single month of photos, hiding photos/videos shot at other times. Select all of the photos in the Grid below and drag them to their applicable month folder. Regardless of where they’re currently stored, they’ll all be moved to the new month folder. Repeat steps 4 and 5 until all of the photos are in the new dated folder structure. There may be many leftover empty folders in the Folders panel – these can now be deleted. Hopefully, by the time you’ve finished all of the tidying up we’ve been doing over the last couple of months, you’ll have a wonderfully tidy catalog, and you can concentrate on actually working with your photos instead of managing them. Next week, we start on a whole new topic… Lightroom mobile! This has been a really great series of articles. I hope and am sure that the LR Mobile one will be as insightful and well explained. Thank you Robert. I’m really enjoying sticking to a theme for a few weeks, rather than just doing random posts. 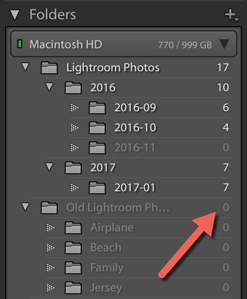 Is there a way to tell Lightroom to forget any folders that have 0 images in them, or do you need to remove them individually? You have to remove them individually, but you can select multiple folders and hit the – minus to remove them all at once. 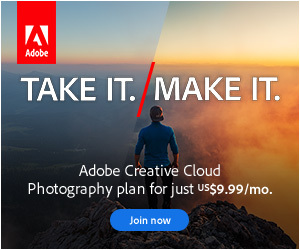 Is there a way in Lightroom to select photos within a folder that were taken in a certain month, regardless of the year? I have a folder of photos taken in my garden. This contains sub folders with imports of photos on particular days. I would like to select all photos within these sub folders taken in, for instance, April spanning all the years. So photos taken in April 2017, April 2016, April 2015 and so on would all be selected. Even better would be a Smart Collection that selected these. 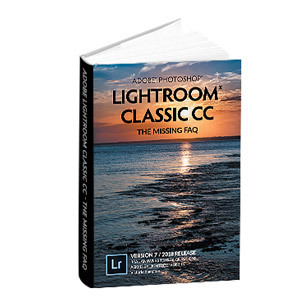 I believe there is a third party plug in that could do this but it would good if Lightroom could do it. Thanks, if you can’t do it then I know to stop trying. I’ll look at the plug ins. There is a way to LR do it automatically. 3. Import all the photos in the new catalogue, using a rule to organize the files by date. I use it often with people who want to reorganize their files by date and it works fine. It works fine if they don’t mind losing a load of their work. Many things aren’t stored in XMP, including flags, virtual copies, Develop History, Develop panel switch positions, Collections, Publish Services, Books, Slideshows, Saved Prints, Web Galleries, and a bunch of bits I can’t think off the top of my head. That’s potentially quite a lot of work to lose, when there’s a relatively easy way of doing it and losing nothing. You’re right Victoria. We need to be carefull about what might be lost by my method. 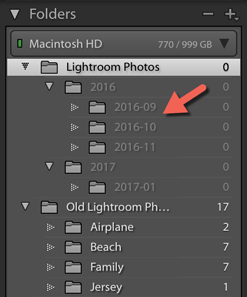 My method is more usefull for people new to Lightroom who want to reorganize their bunch photos with the date structure. There is a cullprit, however, when the names of the old folders describe the content (event, places, people, etc.) These infos are metadata that need to be introduced in LR. Absolutely right Philippe, folder names are easily missed. Hi. As a refugee from several other photo managment programs I found that my catalog had several places where I had duplicate raw and jpg files in the same directory. The big problem is that not all jpg’s are duplicates. To help untangle the mess I setup a metadata filter using date and filetype similar to those discussed above and used select all in the filmstrip to highlight the CR2 files. Flipping the filter from CR2 to All made duplicate jpgs show in the filmstrip as non-highlighted photos. Then selecting and inverting the selection allowed me to identify the non-duplicate jpgs. (This sounds a lot harder than it really is!). 1. Setup the metadata filter. In my case the filetype filter gave me the choice of showing all types, jpgs or CR2 files. 3. Select all of the photos in the filmstrip. These photos will all be the CR2s. 4. Go back to the metadata filter and choose all filetypes. You will now see a series of alternating highlighted/non-highlighted photos in the film strip. The highlighted ones are the CR2s and the non-highlighted ones are the jpgs. 5. You can scan through the filmstrip looking for two or more adjacent un-highlighted photos – those will be the jpgs that do not have a corresponding CR2. 6. Select the non-duplicate jpgs you want to save and switch the metadata filter to jpg. 7. Choose invert selection from the Edit menu. Now all of the duplicate jpgs will be highlighted (selected) and the non-duplicate jpgs will not be selected. At this point you can move, remove or delete the highlighted duplicate jpgs without affecting the non-duplicate jpgs.